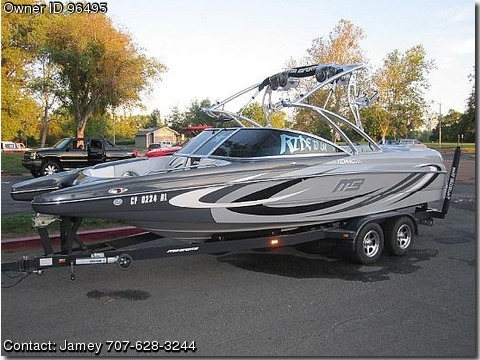 Please call boat owner Jamey at 707-628-3244. 2009 MB Sports F23 Tomcat Loaded 23foot7inches long, seats 16 people , Mechanically sound. 2400lbs stock gravity fill ballast, fills in 90 seconds drains in under 60. PCM ZR409 motor, Zero Off GPS speed control. More insterior LED's than you can count , 4 battery two bank battery system , Wetsounds WS420 control with 4 wetsounds REV10 speakers with RGB LED speakers rings and grills. L7 12 sub with 1500 watt amp with back lit LED's. 17 Stainless steal cupholders with LED cupholder rings. Pivoting surfwakeboard racks, tons of in boat storage. Always kept under a covered slip on a hydrohoist. Calltext or Email with any questions 707-628-3244.